Science Museum Cosmic Rocket - spacekids - space toys, dressing up costumes, kids spacesuits, astronaut food, cool space stuff! Experience exciting rocket-launching fun with this vinegar and baking powder fuelled rocket. 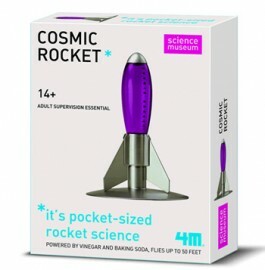 Make the rocket, take it outside, fuel it up and watch it blast off with amazing thrust and fly up to 30 feet.